Wikipedia (reference below) defines performance improvement as measuring the output of a particular business process or procedure, then modifying the process or procedure to increase the output, increase efficiency, or increase the effectiveness of the process or procedure. “Performance improvement can be applied to either individual performance such as an athlete or organizational performance such as a racing team or a commercial business. 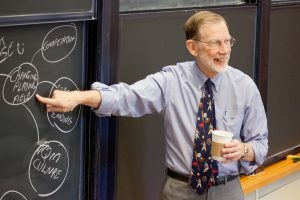 Bob Behn at the Harvard Kennedy School is perhaps the most sophisticated and practical academic writer on improving organizational performance in the public sector. He has, since September 2003, produced a highly readable free “Bob Behn’s Performance Leadership Report” (report archive at: http://thebehnreport.hks.harvard.edu/archive, full website above right). Wikipedia, Performance improvement, at https://en.wikipedia.org/wiki/Performance_improvement, accessed 20 November 2016. Page created by: Ian Clark, last modified on 22 November 2016. Image: Bob Behn’s Performance Leadership Report, at http://thebehnreport.hks.harvard.edu/about-bob-behn, accessed 20 November 2016.